If you are looking for information on the TheHomeMag franchise business opportunity, TheHomeMag franchises or TheHomeMag franchising, then you have come to the right place. 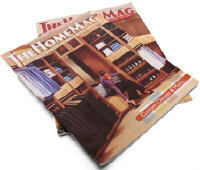 TheHomeMag is your leading local home improvement direct mail Magazine. The Magazine is the Franchise, and its success is directly connected to each Publisher - our franchisee. Our franchisees publish their local edition of TheHomeMag by leading their team of sales consultants and office staff toward the best publication each month. TheHomeMag is the leading advertising vehicle for home improvement professionals available and under your direction, guidance and effort, is the ideal business opportunity. TheHomeMag is comprised entirely of advertisements with absolutely no articles, editorials or advertorials. We create our advertising through a unique process designed to specifically generate consistent home improvement leads for our clients. By combining a great looking magazine with local home improvement businesses, the homeowner receives a consistent and reliable resource for updating and improving their home without ever lifting a finger - with the exception of dialing a phone number. Innovative & Proprietary Lead Generating, Call-to-Action Ad Design Process. Home Improvement is currently a $300B/year industry, projected to reach $380B/year by 2013. Protected full-market territories with only 72 very viable markets remaining (09/09). Unique and one-of-a-kind Support system. We are your back-office. Price of a Sandwich shop, but with the Revenue of a 5-star Restaurant. 5-Day work week: you can Work to Live well, not Live to Work more. Minimum overhead while your Operating Capital remains yours. Proprietary Call-Tracking System means you and your clients measure real advertising results. We are seeking Intrapreneurs: those that thrive in an existing system yet are still driven by an entrepreneurial spirit. Do you have that ambition to launch a new venture in your local market? Are you a visionary that sees potential when others see risk? Are you ready to drive a system designed for success? If this speaks to you, then we encourage you to explore a little further into TheHomeMag, the nation's leading home improvement publication. Vendors are in Place - your Printers are pre-negotiated with nationally managed pricing and Quality Control. The US Postal Service is ready with your National Account status and pre-arranged postal discounts. All other Vendors including Call-Tracking, CRM/SFA system, Residential List, and a few others are in place, pre-negotiated, and waiting for you. Training - No publishing experience is required; we train your entire team at our Franchise Support Center and in your Protected Market. We even help you hire your personnel and find the right office space. Support - We're involved with you from day one throughout the life of your magazine. From the initial training to your first issue and throughout every magazine thereafter, we'll be involved along the way. Our industry leading support team works with you to ensure that every Ad is created to generate leads - every Issue. Our job is to Support your efforts, and that includes keeping you on task toward producing the biggest and best magazine possible month after month. We develop marketing collateral, your web presence, digital magazines, new-hire and personnel management techniques, and we also work and refine your mailing lists, your call-tracking system, and provide regularly scheduled email campaigns on your behalf - to name a few. We are both In Business to Grow Business together. Your purpose is to grow the businesses in your local market. Our purpose is to grow yours. Finally ... think about it. You lead a small group of people in selling an industry leading advertising process and publishing a stunning high-end magazine each and every month for years to come. Local businesses will be vying to be on the cover of your magazine. You'll be known as the Publisher of TheHomeMag®, the magazine that gets results for its advertisers. We have the markets identified and the systems and training in place. The only component we lack is you - the local Publisher. If you have the vision to see yourself in this role, then you owe it to yourself to learn more about becoming the next Publisher of TheHomeMag®.